Another great question with an “it depends” answer. Here’s why it depends. Some hospitals and doctors routinely report to credit bureaus. If a bill isn’t paid timely then it can have an adverse effect on your credit report. Some doctors don’t report when they know they will be paid through a settlement. Whether you pay early or later simply depends on the circumstances. The amount paid or owed is considered in the damage award. Which Providers Are Entitled To Recoup After A Settlement Is Received? Emergency rooms physicians, hospital billing for prolonged stays, rehabilitation therapists, trauma counselors, will typically recoup reimbursement once the settlement is achieved. I treated these sources as an “advancement of funds” because their services cost. What we’re seeing is a growing trend in clients getting loans on their prospective personal injury case from loan companies. You see these advertisements on television. These sources come with a high interest rate, and in our opinion creates more difficulty in resolving the case. In all fairness, however, normally the client needs money, but fails to remember this will be deducted from the amount received in settlement. Many clients will refuse the settlement offers simply because they used up the money loaned by these companies. Does Having A Lawyer Involved Tend To Get A Better Settlement From Insurance Companies? You must have the “right” lawyer to deal with insurance companies. Simply having one who may not be experienced or really interested beyond getting a quick settlement is worse than having none. You and your lawyer must have an interest and the competence to advance your case. Insurance companies as I’ve mentioned many times are very skilled at maximizing their profits, hence minimizing yours. That’s the game, and they play it well. It’s not a game for us. Don’t play it if you’re not prepared to win. Does The Threat Of Going To Trial Garner A Better Settlement Offer From Insurance? The insurance companies must know that you are the trial-seasoned attorney and the threat is indeed not simply a threat, rather a real possibility. The insurance company in the early stages made the determination on the assessment of damages what the maximum payout will be rather than going to trial. Our goal is to go get that for you. You go to trial not just for a few dollars more but because justice requires that you should get more. Sometimes insurance companies know they should pay more but will not do so without a jury ordering it. Remember the game is profit. The longer they can withhold the money from the client, the more profit it is to them in terms of interest earned on that money or the use of it in other matters the insurance company invest itself in. Going to trial should be a well thought out matter discussed with your attorney with full knowledge of the implications of going to trial. How Does An Attorney’s Trial And Negotiation Skills Impact A Personal Injury Claim? The experience attorney should have “experience you can trust!” That’s the Jimerson Law Firm’s motto. That means we’ve seen it all, been there, and willing to go there again if it means the best interest and results for the client are served. Insurance companies know this as well. In the past, we have seen where insurance companies put out the list of attorneys where they encourage or direct their agents to stall the settlement, low-ball the offers, and even force going to trial. These are all bad faith actions by the insurance industry. An attorney must be willing to take these companies to task for such actions. Our name is not on the list because the industry knows, we’ll do whatever is necessary, and what’s right for the client. The insurance company can face separate lawsuits as well for the bad-faith claims. Lawsuits means lost profits, so you be the judge whether experience matters. Certainly the “Experience You Can Trust” matters indeed. Most cases never go to trial and in the small percentage that do, we take steps to ensure that we are very prepared to present them in the most professional manner consistent with superior litigation skills supported by the evidence. The insurance industry is built on profitability. If every case goes to trial, they are going to lose profit. They are also very astute at determining whether something should go to trial or whether a trial is going to cost them more than the bargain to settle. It’s a numbers game for the insurance company but to us, it’s much more. It’s our client’s life, his well-being, his financial security. Nothing is more assuring than an advocate to protect the rights of someone that’s been negligently injured or wrongfully killed due to no fault of their own. Every case is taken very seriously despite the monetary assessment of the case. For more information on Paying Medical Bills As They Come, a free initial consultation is your next best step. Get the information and legal answers you are seeking by calling (314) 786-3536 today. 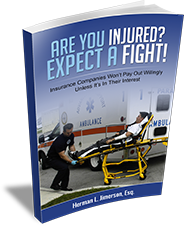 Home > Personal Injury > Should Someone Pay Their Medical Bills As They Come In?